Note: After writing this essay (which was supposed to only be one paragraph), I decided that it needed a title, and "A Place To Bark" immediately popped into my head--probably because it's the name of the non-profit animal rescue run by one of my new favorite people in the world, Bernie Berlin. Talk about perfect timing. I had planned to write about Bernie and all that she is doing to singlehandedly save hundreds of homeless dogs and cats literally destined for death when she had her benefit art auction on ebay up and running. . .well, the auction has begun! I still want to borrow her name for my title, so I thought it only appropriate to mention her here. If you love animals and want to see the amazing difference that one person can make in the world, check out Bernie's blog, A Place To Bark. . . And Meow. Just be sure to grab a tissue first--I don't think I've ever made it through a single post without tears streaming down my face (the good kind). Attention all you art lovers: Click here to go to the ebay auction site where you can support Bernie's animal rescue efforts and purchase one of a kind, donated artwork at the same time. There's a scene in Larry McMurtry's book, Texasville, when Duane's dog Shorty is yapping incessantly, and Duane's wife Karla says, "Instead of getting him neutered, we should have had them take his barker out." Years after first reading it, I still find that line hysterical. I just love the image of a dog having a removable barker. That said, I think one of the best things about living out in the country, miles from the nearest neighbor, is that your dogs can bark as long and as loud as they like. And if you're smart, you quickly realize that is exactly what you want them to do. Rex may have been an escape artist, but he was a very quiet one. He did not whine, and he rarely barked. I don't recall ever having to tell him to hush. Every 10 days or so, he would let out one deep, bellowing woof, and then he would give me a look that said, "I couldn't help it, Mom. I was about to explode." And I always told him that I understood completely. Rex clearly realized that, hard as it might be, one must strictly obey certain noise ordinances when living in a crowded urban area. As soon as he moved to remote Windridge Farm, though, he instinctively knew that the rules had changed, and he immediately began making up for lost time. He barked at absolutely everything. He barked at squirrels and birds in the trees and airplanes that soared overhead and cars a half mile down the driveway and faraway hounds in the woods. Sometimes he simply barked for the sheer joy of being able to do so. It was wonderful. Now I live with Robin and Bear, and they both take their guard dog duties seriously. These duties mostly include barking of course, and sometimes the two of them go at it all night long, bravely protecting us from monsters and unknown enemy attack. And although their yelps and howls often wake me up, I never get angry or annoyed. It's reassuring to hear that they are hard at work, and it's easy to fall back to sleep because I know that I am safe. I have also come to know their many different barks along with their corresponding meanings. I can easily tell, for example, if they are barking at something that is far off in the distance or right here in the yard. And so early this morning when both dogs began simultaneously howling their heads off while I was still padding around the living room in my slippers, I knew right away that something they considered very bad was not far from the house. And I was right. I opened the back door in time to see Bear race across the lawn, shoot through the fence, and tear up the wooded hillside after a coyote, letting out a stream of ferocious woofs the entire time. Robin was nearly as loud and not far behind. The coyote count far outweighs the human one in our little valley, and if I'm outside at night I can often hear packs of them singing to the stars and the moon. That's one of the other great things about not having any neighbors--you are free to howl right back at them, and so I usually do. I used to think that glimpses of coyotes were more common in the days after snowstorms because the animals were driven out of hiding in search of food. This morning, though, as I watched that grey-brown, furry body and bushy tail lope off into the woods, I realized that I was probably wrong. The coyotes are always close by--they're simply easier to see against a snow white backdrop. It's not a very comforting thought, but I know I need not worry. My loudly barking dogs are on the job. Attention Dog Lovers! This is Weekend Dog Blogging #63! Head over to Sweetnicks every Sunday night for the complete roundup of cute canine candids. Wanna join in? Just post your pup and email the permalink to Sweetnicks. I couldn't help but be reminded of "Silver Blaze" (the dog that didn't bark); my favorite Sherlock Holmes story! The clue to solving the mystery was, of course, the dog who hadn't barked when he should have. Great post! Of course any post about a dog is a great post! We were fortunate to find our lab Ben at our local no kill shelter and he is the love of our lives! I love reading about all of your critters but especially the very handsome Bear. 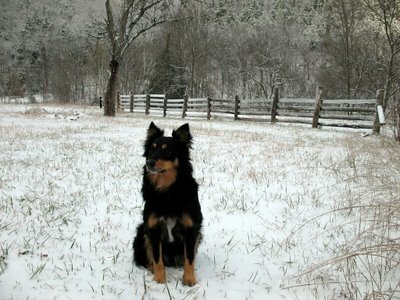 I have an Australian Shepherd that really needs a country home and acreage to manage. You have some lucky dogs! And by the way, I am pretty new to keeping up with your blog and so happy that I found you. This is really great reading and inspires me not to give up on my hope to move out of the city. O.K...your posts always move me in some way, but I found myself a bit spooked...thinking the coyotes are always there...looking in on you. Shivers! And nerves on edge for your precious sheep. When our farm dogs are going at it at night, the only ferocious thing (that I think)they are encountering are hungry racoons and large bucks. Cheers to Robin and Bear! That photo is amazing (I seem to use those words a lot when it comes to your photographs)...almost as though you photo-shopped the dark coloured dog onto the white snowy background. No wonder the coyotes are easier to spot, too. My Casper is a rescued dog from Louisiana (before the hurricane) and had just 10 minutes to spare before he was to be gassed. He was vetted and fostered there for 6 weeks (heartworm treatment) and then boarded a plane for Canada, thanks to 1atatime Rescue in Vancouver. He's my constant barking companion, but the Jack Russell in him is all the excuse he needs for that! Wonderful story on barking. Dogs always surprize me with their understanding. I have known people who have -- literally -- had their dog's barker removed. It is some kind of throat surgery, and it seems like mutilation to me. All the dog has left is a sort of cough. Geez, why have a dog if you can't have the bark too? I, on the other hand, have a Sheltie who doesn't know he's a dog. But he doesn't bark. He yaps. Incessantly. Wonderful essay and wonderful photograph - with 3 dogs I certainly sometimes whish I could temporarily tkae out their barkers! Am off to check out your friends blog and auction now, I have the tissues to hand - just in case. When I lived in Missouri, we lived outside of St. Louis in the woods (which I believe is all suburbs now...) and we had bobcats. Do you have bobcats? Those suckers are nerve wrecking! We'd hear them now and then, and one of our neighbors' dogs was out playing in the woods and was attacked and killed by one of them. I have to say though, I live in Texas now, and I really miss Missouri winters. They were beautiful. One year we had 6 inches of ice, and then 6 inches of snow on top of that! We were snowed in for a week! I was a kid, so that was possible the best week of my life!...We went sledding without sleds it was so slick! :-) And our dads had to use golf shoes to get to the mailbox...a quarter mile down the road! See, now I love your pooches even more. They chase the coyote off your property so that the sheep can sleep in peace (relatively). Sometimes I wonder about all the cattle and sheep farmers that complain about the laws protecting the reintroduced wolves. They say that it keeps them from safely managing their stock. My thought is that if these farmers had dogs like Robin and Bear they wouldn't have to worry about wolves or coyotes tippy-toeing into their pens at night and "maiming and killing" their animals. Plus, it's always nice to see dogs doing what they were meant to do. We have wolves around here, and they're afraid of dogs only in that dogs indicate the presence of humans. Jasmine (our Great Pyrenees) has been known to bark at strangely-shaped clouds! But I know exactly what you mean about the different sounds of the barks. If I'm paying attention I can tell the difference between the 'possum bark and the mean-meter-reader bark. That was a wonderful story. Lets just hope that bear doesn't come for your dogs soon! My dogs have different barks too. My little Hershey has a hilarious "Get over here because my tennis ball is behind something and I can't get it!" bark. when i grew up, we got a doberman puppy. He would do his little puppy yaps. Needless to say he grew and grew. One day, he was in the back yard in let out a big WOOF. He scared himself silly. He jumped up in the air and looked around as if to say "Who said that?!?" I love reading all your dog stories!